U.S. News & World Report has published an interesting article titled The 10 Worst Presidents. By following links from the article’s main page, you can find out how it was determined who were the 10 worst (with a short comment on each one), read a discussion about scholarly consensus on presidential rankings, and read an update on what historians think today. The author of the article, Jay Tolson, used a variety of media sources and the views of a respected historian to develop the list. It’s hard to disagree with the selections. 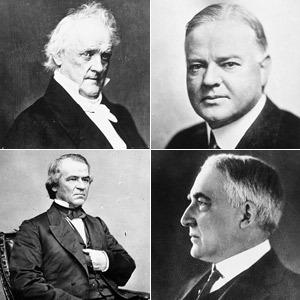 The most recent presidents among the 10 worst are Herbert Hoover (tied at #9) and Richard Nixon (tied at #9). Jimmy Carter (#11) barely missed the list. Keep going, and you find that a survey of six historians and political scientists conducted for C-SPAN ranks George W. Bush among the worst 10. In my opinion, this constitutes professional malpractice, especially among the historians. Not that Bush was a good president — he wasn’t. But assessing a president mere months after he left office does little more than reflect the passions of the moment, especially among academics whose ideological bent generally leads them to disdain conservatives and swoon over liberals. Time is the yeast that leavens history, and not nearly enough time has passed. Historians, of all people, should know this. At the end of one page, there’s an internet poll listing all former presidents and asking readers to make their choice of the worst. The winner is George W. Bush, of course, with 31 percent of the votes. This highlights my concern about public opinion polls in general. How important is it to find out what people think of an issue when most aren’t qualified to even discuss it? How much should we care what people think of presidential rankings when most can’t even name 10 past presidents, much less evaluate their performance in office? When I was an undergraduate student in political science, my department held an annual celebration of the birth of Millard Fillmore (#5). This was because we considered him the most useless of all presidents and the one who did the least, thereby meriting recognition. After going through the list, it seems that the only criterion for making the list for many of them was how they dealt with slavery. Andrew Johnson, whose name should be on the list, is cited for his opposition to the 14th amendment, which was about the only thing I can think of that he did that should have been done. Johnson’s administration was corrupt, perhaps the most corrupt in presidential history. William Harrison was included even though he was president for only 30 days when he died. That’s just silly. Smoot-Hawley was a bad idea, but no worse than some of the things we do now (NAFTA comes to mind, even though it is supposed to encourage free trade). Hoover’s biggest mistake was in not moving to repeal the charter of the Federal Reserve, for which this single act alone should Woodrow Wilson have been included on this list. Compound this with the support he gave for the 16th, 17th, and 18th amendments, and his mishandling of WWI/Treaty of Versailles should have vaulted him right to 1st place. It was, after all, the Federal Reserve that removed 25% of available cash from circulation in Sep/Oct of 1929 which precipitated the run on banks. Why not include Rutherford Hayes and Lyndon Johnson on this list? Both were corrupt to the core. I agree on Harrison. My reaction was the same — how could he be one of the worst presidents with only one month in office? He shouldn’t be considered in this kind of analysis. I would agree that Hayes should be on the list. It’s interesting that he was one of the few who lost the popular vote but still became president. I’d also have Carter on the list (even though I voted for him twice). I don’t know about Johnson. He should burn in hell for what he did regarding the war in Vietnam, but he did a lot of good in regard to civil rights and poverty programs. I don’t think he can be fairly blamed for the way some of these programs worked out over the long term. If a certain degree of political corruption puts him on the list, then the list needs to be much longer. One of the problems with LBJ was that he didn’t care at all about the plight of the blacks. He saw Civil Rights legislation as an opportunity to gain power. Here’s a quote from a 1957 address he gave: These Negroes, they’re getting pretty uppity these days and that’s a problem for us since they’ve got something now they never had before, the political pull to back up their uppityness. Now we’ve got to do something about this, we’ve got to give them a little something, just enough to quiet them down, not enough to make a difference. For if we don’t move at all, then their allies will line up against us and there’ll be no way of stopping them, we’ll lose the filibuster and there’ll be no way of putting a brake on all sorts of wild legislation. It’ll be Reconstruction all over again. And I strenuously disagree with your assessment that he cannot be blamed for what was done with his legislation. His legislation vastly increased the scope and power of the federal government. Power in government, as I have repeatedly pointed out, is inevitably abused to the benefit of the abuser and his/her cronies, and to the detriment of absolutely everybody else. Someone as worldy and earthy as Johnson was would surely have known that. “Naive” and “Lyndon Baines Johnson” are as far apart as Pluto and the Sun.